Aniracetam is a nootropic supplement under the racetam class that is regarded as being significantly more potent than Piracetam. In addition to the cognitive enhancement it provides, it also acts as an anxiolytic and improves mood, memory, and focus. This is likely achieved through its effects on the D2 dopamine receptors, acetylcholine receptors, and 5-HT2A receptors. 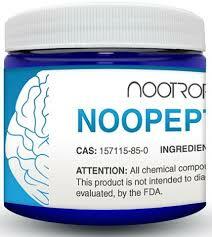 However, it is still under investigational usage for treating various neurodegenerative disorders. It also affects the AMPA receptor and is a drug that is thought to offer benefits for individuals with neurodegenerative disorders. Throughout European countries, it can be obtained as a prescription drug, but has never received any approval by the FDA for usage in the U.S. Aniracetam is fat soluble. 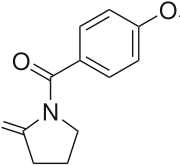 Aniracetam is categorized under Racetams. It is also known as 1-p-anisoyl-2-pyrrilidinone, Ro 13-5057, CAS 72432-10-1, 14-methoxybenzoyl-2-pyrrolidinone, Draganon, Sarpul, Ampamet, Memodrin, Referan. Are you feeling gloomy, and have trouble focusing? This ‘supplement’ or more like a synthetic drug belongs to the Racetam family and is gaining popularity for its numerous benefits, including an overall enhanced cognition, improved mood, an improved response to stress. Aniracetam does not only influence an increase in Acetylcholine and Glutamine levels but it also directly influences an increase in Serotonin and Dopamine levels in the brain. These two neurotransmitters are solely responsible for an individual’s mood and anxiety level. Serotonin, specifically, helps to regulate the circadian rhythm (the sleep-wake cycle of our body). Aniracetam acting on these two agents brings about an enhanced ability to deal with stress and leads to a better mood (1). It has been shown that Aniracetam serves to increase glucose metabolism. There is an increase in efficiency with the consumption of glucose and oxygen within the brain, because of this mechanism, mental energy is increased (1). With this, individuals requiring long hours of work and studying may greatly benefit from Aniracetam. 1,500 mg/day broken into doses of two or as needed. The most notable side effect of Aniracetam is headaches. However, it can be eliminated with the addition of Choline. Choline can be obtained via eating eggs or supplementing on Alpha GPC and other related supplements. Other side effects include nervousness and gastrointestinal problems. An obvious one, but it is crucial for any drug or supplement to be taken at the right amount and frequency for it to produce the desired effects while possibly eliminating or minimizing the undesired ones. Generally, a dose of between 600 mg to 1500 mg may be taken daily for an individual. However, Aniracetam has low bio-availability (fat-soluble) and a short half-life of 1 to 3 hours. It is thus recommended, that it be taken at a larger dose and administered at multiple times a day. It may be taken 2 to 3 times a day, once possibly in the morning, and then in the afternoon and/or evening. (3) Daily dose should not exceed 1500 mg to avoid adverse effects. Though it can vary based on body weight, but keep in mind the low levels of LD50 for this drug. The LD50 is 4.5 g/kg orally in rats and 5.0 g/kg orally for mice. For the treatment of Alzheimer’s Disease and Senile Dementia, a dose of 1000 mg to 1500 mg per day is generally taken at a single administration or is divided into two separate doses. When starting with a new drug (or supplement as we are calling it here) Aniracetam, researchers suggest to start with the lowest possible dose, such as half a pill of Aniracetam that is 375 mg, and then gradually increase your intake. Stacking can lead to synergistic effects depending on the individual, however, it is not recommended you start with a stack. The purpose of stacking is to maximize a drug’s potential to yield more positive effects or to eliminate or minimize the side effects that the drugs may provide. Since this drug belongs to the family of Racetams, Aniracetam is best stacked with Choline. Some good sources of which include Alpha GPC, Centrophenoxine, Citicoline among others. 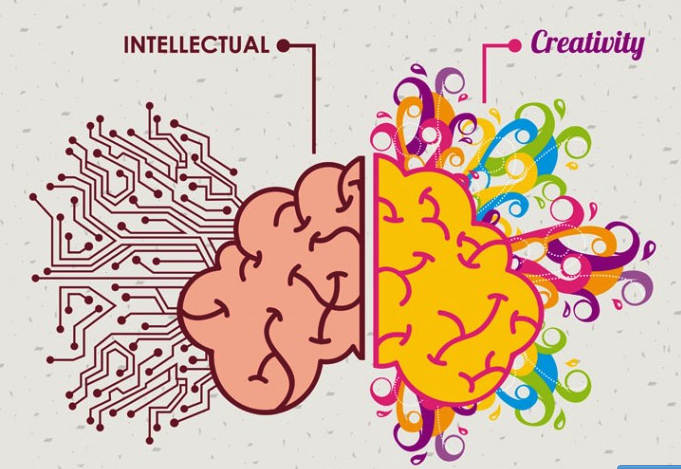 Choline is considered a vital component in a stack involving racetams since racetams act as Cholinergics, thus, requiring a reasonable and sustained source of the neurotransmitter Acetylcholine. A good stack that you may consider will be a combination of Aniracetam and Oxiracetam. As a pure cognitive enhancer, Oxiracetam is best paired with Aniracetam due to the latter’s additional benefits such as being a mood elevator and anxiolytic and of course, being a potent drug improving cognitive function. Aside from stacking Aniracetam with Oxiracetam together, you might also want to consider another combination such as other types of Racetams such as Piracetam. I have noticed that I can stay focused much longer when taking Piracetam + Aniracetam. A stack needs to cater to your individual needs- physically, cognitively, and even emotionally. However, we should take note to be cautious when taking multiple supplements especially if they are very potent or you have not encountered using nootropics yet. Where can I purchase Aniracetam? Aniracetam powder is readily available as well as Aniracetam pills and capsules, however, some users find the powder form to be cheaper than the capsules. Should you be confused as to purchase the powder or capsule form, rest assured that the effects will remain the same for both of them and the choice dramatically depends upon your preference and the amount you want to spend. As always we recommend NootropicsDepot, if you are looking to buy quality supplements, they also provide a COA for peace of mind. Click here to purchase it online. Every one of us at one time or the other in our life took a break from all activities and decided to ponder on the question – who am I and where am I really from? These questions have caused many people to look for answers in different places and things like in music, arts, literature and other soul-searching avenues. This has been a major concern in the last few years. But now, this challenge has brought about the ever booming DNA testing kits, which a lot of people have been helped to get answers to the aforementioned troubling questions. DNA tests offer unbelievable insights into your genetic roots and the regions that your ancestors might have migrated from. It also explains where your ancestors settled thousands of years ago preceding your birth. 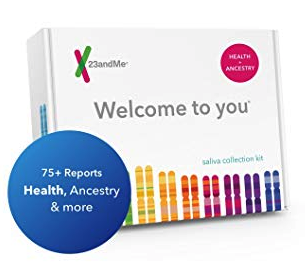 Ancestry DNA and 23andme are among the most widely used DNA testing companies in the market due to their simplicity and satisfactorily reports to customers. This article is positioned to examine these two DNA testing companies and give you tips on solving the mysteries behind your hereditary. Its complete package is $99 and $69 if you go for a special offer. You pay $9.95 for the initial kit and $4.95 for an additional kit. $24.95 for initial shipping of package and $12.95 for an additional package. 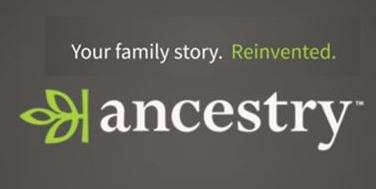 AncestryDNA is the foremost brand of ancestry.com and the largest genealogy website in the world. You can use the company’s database which has over 6 million users and over 17 billion reachable search records when you register with them. Their unique service can help you trace your ancestors through 350 regions across the world in an affordable and easy to understand way. Easily paired with a membership to ancestry’s large database records. Shipping cost is $9.95 exception of expedited shipping cost of $36.95. 23andMe offers many fascinating benefits. The name 23 stands for the 23 pairs of chromosomes present in your DNA. This proves the authenticity and seriousness of the company on lab work. You can know the basis of your DNA on over 150 regions across the world in the 23andMe testing kit. Here you could easily find out which ancestors “DNA families” you belonged to, and possibly traced them from both your maternal and paternal sides. It could also lead you to know your Neanderthal DNA and how much of it you inherited. 23andMe could also help you link up with people who share DNA with you. Ancestry DNA is managed by ancestry.com, the world’s most advanced genealogy tool. Opt-in for membership to enjoy ancestry history records which could help you to uncover your family tree. Ancestry DNA gives you an extensive info on your family tree, how it started and spread to over 350 regions around the world. These regions comprise of major places in Europe to countries or specific cities in places like Norway or Iceland. Ancestry DNA also gives you shared ancestor’s hints which could help you discover intriguing connections that you never knew your family had. But on 23andMe, their kit is more than that. It will help you to know your personal health history and how to handle it. You will also get health risk report which could help you to access the possibilities of getting Alzheimer’s, Parkinson’s and Celiac diseases. You get a comprehensive report that covers fibrosis, sickle cell anemia, inherited ear defect, and more. 23andMe as a scientifically based company could give a detailed report of your background in a hurry. 23andMe also with ease could match your DNA to other people that share some DNA with you. You could know the number of Neanderthal DNA that is in you. Ancestry DNA and 23andMe test are done through a saliva sample. You spit into a small collection tube and mail it back to the companies in an envelope. With ancestry DNA, you should receive the package within a few days of ordering and send it back expecting to get results not later than two months after the lab might have got it. 23andMe is almost the same though you could go online to track the results. The results are usually posted online on the 23andMe website. You could access the results online with your password. You can check your sample status anytime you like on AncestryDNA when you register online and also have sent in your sample. Once you’ve done with testing and got your results posted, you could explore your ethnic background and check out your bloodline’s culture, history and locations, and the DNA that matches yours. 23andMe offers diverse ways to check what your genes say about you. You will receive your ancestry composition reports, genetic background as well as your health test. These are arranged with educational tutorials to aid your understanding of the whole process. Database of 23andme is huge. There are over five million customers who have used the 23andMe DNA test since the company’s inception in 2006. About 80% of these users have agreed to allow the company to use their results in research studies. Ancestry DNA, on the other hand, has over five million customers’ database. Both companies have made provision for users to match their DNA with others, therefore, giving you the opportunity of locating a long-lost relation you never knew existed. Both companies offer great packages for the customers who desire to learn more about themselves, their history, and who they really are. 23andMe has made provision for checking all your health issues except that this benefit is not free. Ancestry DNA has a formidable platform and features that have endeared more customers to them. Information on your ethnic background and where you migrated from are available on the company’s large database. AncestryDNA gives you info about your ancestral records in a price that is cheaper than others in the market. We have also reviewed MyHeritage DNA here, additionally, we also recommend you learn more about Vitagene here. MyHeritage is known as one of the original DNA testing kits in the market. In addition, MyHeritage has an in-depth ancestry tracking. The pricing is fair and the kits are user-friendly. MyHeritage offers DNA and genealogy services. The personal information you stand to gain from the company is large. Its archives of information will lead you from family history to the actual hereditary expert. MyHeritage DNA reviews from customers suggest a powerful option that provides the best of two worlds. Choosing MyHeritage enables consumers to experience a great deal about themselves. The cost of taking MyHeritage DNA test when compared to other testing kits is very cheap. Though it lacks information on health reports, nevertheless, they produce data on origins and ethnicity. More information on your recent ancestors are readily presented. Online activation is fast and easy. Intensive ethnicity information than what other DNA test kits have. Has over eight billion history documents, up to three hundred million photographs, family trees of over thirty-four million and over 2,000,000 names in ancestry trees. What’s exceptional about this testing kit is you could discover larger information about our ancestors as well as your family tree, as centered on your DNA results. 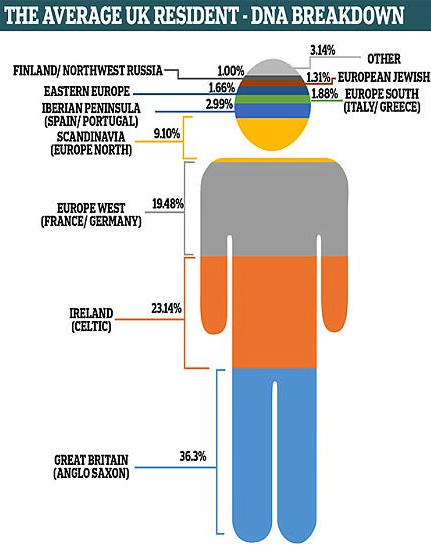 Ethnicity Analysis of MyHeritage Kit users is measured in percentage. It has over 40+ estimated ethnic regions in its database for checking your DNA lineage. Furthermore, as a customer, you can access the Ethnicity value free of charge as long as you have uploaded your DNA data to MyHeritage from other services. MyHeritage relies heavily on its database of 2.5+ million customers, which implies that many people are fully guaranteed to locate some kind of familial match. Yet one way to utilize this database is for paternity testing. 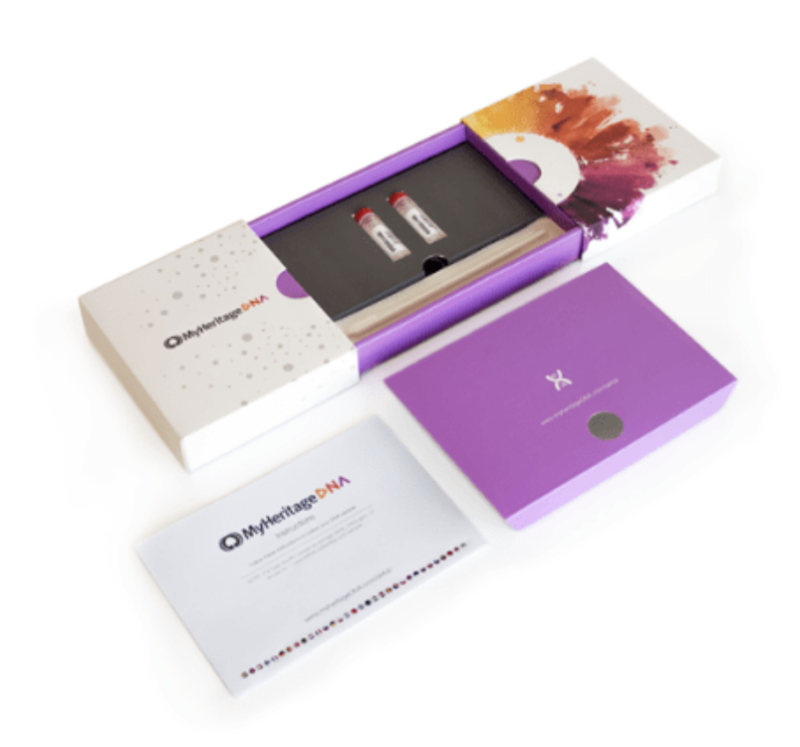 This DNA kit could be better than the top paternity test companies. In the genealogy market, with an incredible number of users with over 3,000,000,000 consumers in its records, and has up to 9 billion older records. In fact, many people trust the kit for family tree results. Also, the testing solution can be gained in traction and reviews which could be positive while the company produces out a lot of impressive features. Upon receiving the kit, you need to subscribe online, which takes only three minutes. Then take one of the several enclosed cheek swabs, and scrape gently within your cheek for 30-60 seconds. Then place the swab among the plastic vials you have received. Close the container, and repeat with another pad on the other cheek. Place the two containers in the transparent plastic bag and then seal the bag in the envelope. Place stamp and address an envelope, send it off, and that’s it. The application process on the site is, in fact, straightforward, and only the basic information is required. You log in together with your MyHeritage details and enter the initial number that is incorporated with your kit. MyHeritage DNA kit when ordered could be tracked after the payment process is completed. On clicking the “Manage DNA kits” menu bar on the MyHeritage site, you’ll see the tracker. You’ll get constant updates and you may click through for more details. The kit requires a week to be delivered but often quicker. Once you’ve done the test, make sure you sent it off to the lab, results simply take 4 weeks. When your result is ready, you’ll get an email, and you’ll be capable of seeing your complete results on their website. Your report will contain your ethnicity, which supplies an overall idea. You may then view ancestral lines, maps, and explanatory notes. It offers you with DNA matches with possible family, and you will receive alerts when new family members are found. All this emerges in diagrams representing what sort of various members of the family fit together, especially the various possible types of a cousin, which may be confusing to those not used to family trees. It goes to identify individuals who’ve other common traits, including surnames. The data received from ancient migration methods was less than what was deduced from other DNA tests companies available on the market, however, the focus with this information is to know your roots and ancestors. Customer care at MyHeritage is not bad as the firm includes a reputation because of its agility and detailed replies. The web page supplies a list of FAQs with answers. You may enter a question and it’s likely that it’s likely to appear, in addition to a comprehensive and easy to follow answer, with a help guide. There are free customer support lines available internationally are visibly active in posting on various social media profiles. If you would like another alternative to the MyHeritage DNA test, check out our review of Vitagene. 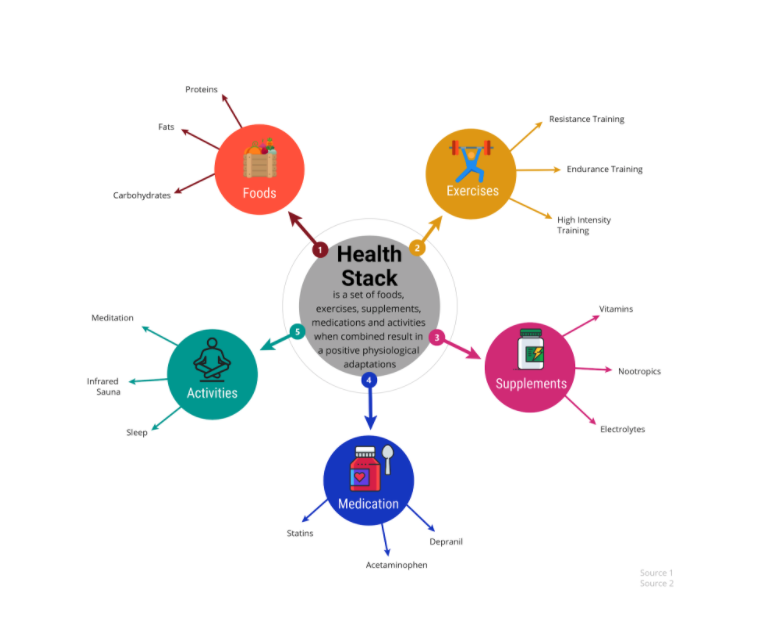 Welcome to TrackMyStack, our platform provides the most comprehensive way for you to manage your health safely to help you reach a better outcome. Please watch the videos below to help you get started. The guide is broken into 5 critical steps. Step 1. Before you do anything, Create a Stack. A stack, in this case, can be seen as a ‘folder’ or a ‘regimen’. The reason we allow you to create multiple stacks is that many people have different regimens for different goals. E.g. Many users create 1 stack for their entire health to make tracking easier. This is what we recommend for most users. However, some advanced users want to manage health symptoms in one stack and make another stack to address health goals to address issues like sleep or anxiety. Watch the video below to see how to create your first stack. Objective: To Create a basic regimen. Start by naming your regimen, then enter your purpose, after that add your supplements and medication with dosages. All these details can be deleted or changed later. This is just a basic list to help you get started, you may tweak and set reminders later. To create your first stack, click here. Once you are done making your stack via the wizard, you should be on your stack page. If not, click here to see a list of all your stacks. Click your stack to see the stack page. Overall Potential Effects from taking the supplements in your stack regimen. Keep in mind this list is by no means comprehensive and you must consult a certified health professional to confirm the safety and effectiveness of your stack. No statements made by our platform is intended to diagnose, treat, cure, or prevent any disease. By Now, you have created a stack in Step 1. In Step 2, you have added or removed supplements and medicine as needed. You may have even set specific adherence and refill reminders. You could have also added specific effects, descriptions, and dosage quantity for specific Supplements and Drugs for this stack. Make Your Stack Private (if need be). This will hide it from the public and is as beneficial as DELETING your stack. We do not allow users to DELETE stacks, but only to archive it for now, you may do so by adding an ‘END DATE’ upon clicking ‘Stack Settings’. You are free to create as many stacks as you like. You may Set overall Stack-Adherence reminders, which are emails you get reminding you to ‘consume’ your stack at certain times of the day. You can click through to see a Calendar-view of your Stack-Adherence by clicking ‘Calendar’. You may click ‘Reports’ to see your check-in posts graphed which you will be creating in the next step. You may edit your stack Description, the Start, and End Date and disable all reminders associated with each stack that may exist for specific Supplements and Drugs. Most users that create a stack want to track their health day-to-day. This helps in the long run as each check-in adds an input to your health report, which you can view in graphs or print to share with your care provider. These journals can be used to determine any triggers for flare-ups you may have and to help you to continue optimizing your health to reach your goals quicker. 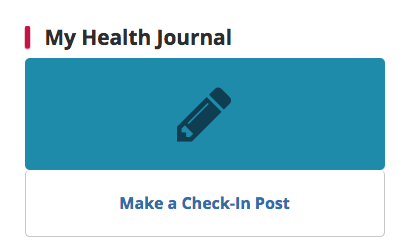 To ‘Make a Check-in’ post you can click here, or you make click the following card from your dashboard after logging in. Record one of many Personal Metrics such as: Sleep hours, Blood Pressure, Anxiety, Mood, Pain, etc. Add your own Custom Field that you may want to track such as: Hours you watched TV, hours you socialized, etc. Adding Caregivers to your stack, this can be a health professional or family that can see Private Stacks and your Check-ins to quickly get a glimpse of your health. 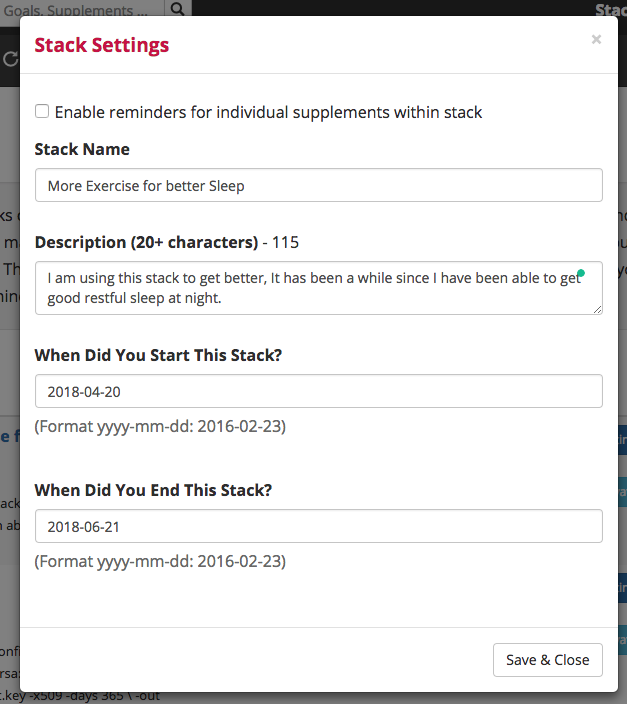 My Reminders – Accessible from your dashboard, this will give you a preview of All Stack Reminders and Specific Supplement & Drug reminders within a stack that you may set. Refill Reminders – Also accessible via your dashboard, this page provides you with a list of Supplements & Drugs that are either depleted. Refill reminders can also be set on a timely basis, such as every 30 days. Past Check-in Posts card is visible from your dashboard, this page renders all your check-ins in one place. 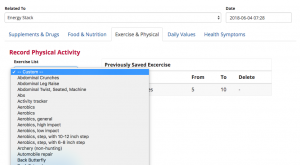 Add/Remove Health Conditions Page – Accessible from the submenu upon logging in. 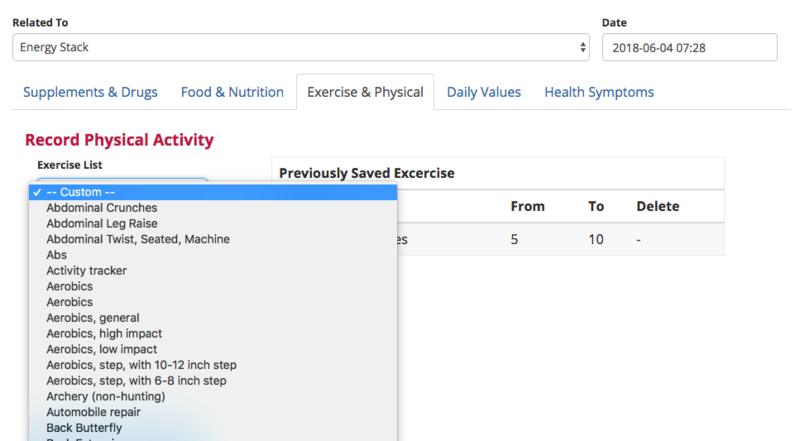 Add/Remove Symptoms Page – Accessible from the submenu upon logging in. Similar Patients – Sometimes it helps to find others just like you to see what they are doing. Stack Wizard – We use machine learning to help you figure out which supplements to take or which stack to replicate to begin your journey faster. Health Reports by Goals – You may use Health Reports to see what has worked for others for things like Cognition, Building Muscle, etc. 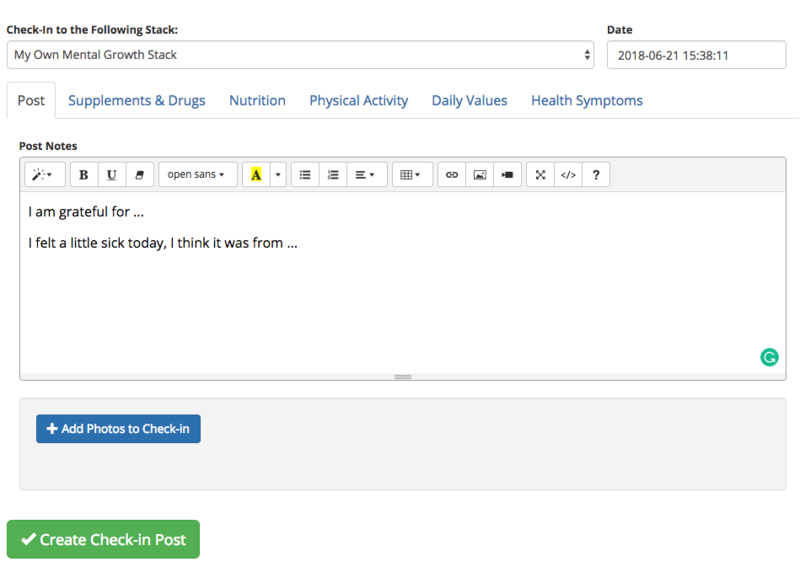 Health Reports by Symptoms – You may use Health Reports to see what has worked for others for different Symptoms like Anxiety, Mood, Stress, etc. 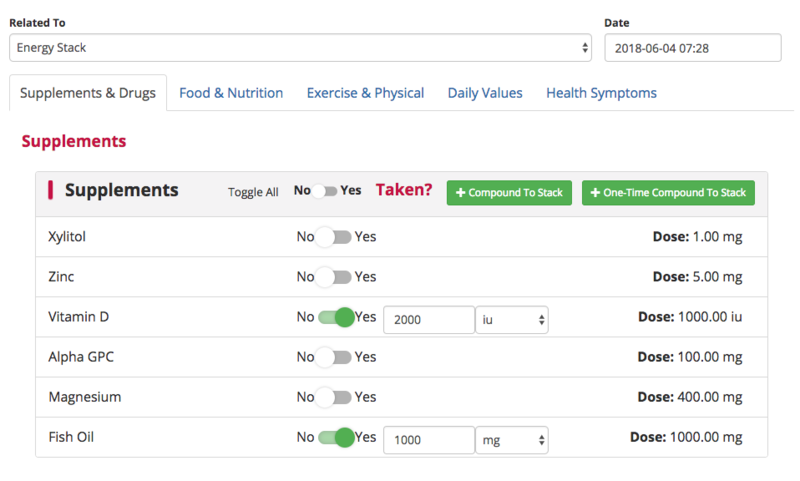 Health Reports by Conditions – You may use Health Reports to see what has worked for others for different Conditions like ADHD, Alzheimer’s, etc. Health Calculators – This page contains an Ovulation and Period Calculator, calculators for BMI, Nicotine replacement, BMR, Blood Pressure, etc. Do I need to create a stack? Please see step 1. You may leave a stack empty (without Supplements or Drugs) and can still write to your check-in journal. How do I delete a stack? Please see step 3. It is not possible to delete a stack but just to hide it from the public, in which case it will still show up on your list, you can additionally delete all Supplements & Drugs within it as well. Keep in mind you can just let each stack stay behind and just create a new one as needed. How do I add Exercise or Sleep to my stack? Please See Step 4. You may click the ‘Physical Activity’ tab and enter your details there. How do I remove a symptom or condition? If you would like to remove it completely, see the link in step 5. Symptoms and Conditions are archived from this page. These pages are also available from the submenu. How do I disable all emails? You need to go to the User Settings page from the top menu, click ‘My Profile’, then click ‘Update Email Settings’. You need to go to the User Settings page from the top menu, click ‘My Profile’, then click ‘Update User Settings’. This does not cancel your subscription nor does it delete all your data, it is hidden and archived from the public. You may log in at a later time to reactive your account. Which supplements should I add to my stack? You may browse through our supplement library here and select your goals from the left menu to see complete reviews and lists. Where do I see all the graphs of my check-in posts to see how I have been doing? You may browse to the My Stacks & Reports page as mentioned in Step 3, and click the Reports button on the right-hand side. What are some specific use cases of TrackMyStack? It can be used to track your health symptoms, medical adherence, tracking nutrition and calories, tracking pain, tracking and managing the efficacy of any treatment or health goal. 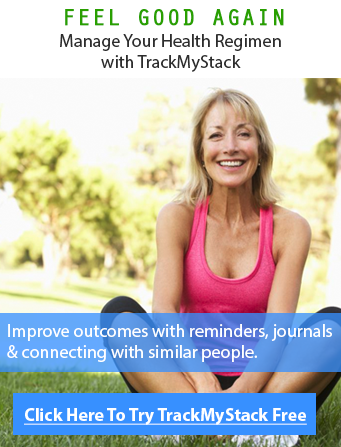 TrackMyStack is a health and wellness platform for managing personal health regimens. We help improve outcomes with reminders, journals, reports and by connecting you to similar users. If you haven’t done so already, you can sign up here.